A idyllic scene of the beach and the glorious fruits of the ocean beholds us in this tapestry scene. 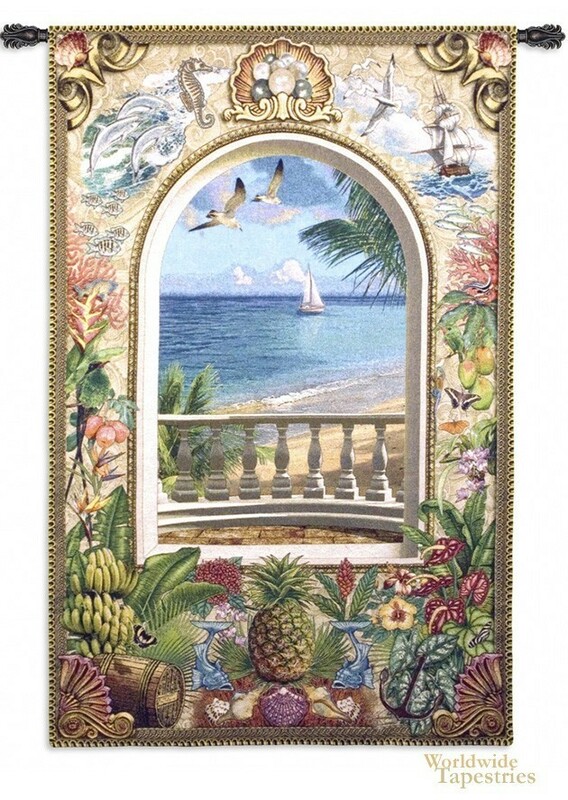 This tapestry "Wish You Were Here" shows the breezy sea and seagulls framed in the foreground by a fantastic representation of the tropics with seahorses, coral reefs, shells, oysters, butterflies and pineapple. It is as if the background represents the ideal destination and the foreground the fruits of the fertile imagination itself. All in all, a glorious scene which says I wish you were here. This tapestry is backed with lining and tunnel for easy hanging. Note: tapestry rod and tassels, where pictured, are purchased separately. Dimensions: W 40" x H 59"